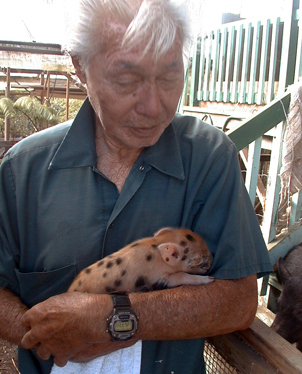 Sueo Matsumoto cradles baby pig Electra at his home in the Fern Forest subdivision south of Hilo. A nasty feud between neighbors has erupted on the Big Island. On one side, Sueo "Su" Matsumoto and his wife, Sharene, love pigs, feeding about 100 of them regularly in their densely wooded subdivision south of Hilo. They have gone so far as to give the regulars names -- Bobo, Dante and Benedict. On the other side, a few hundred feed up the gravel road in Fern Forest, Paul Claes hates pigs. They have torn up his garden, made wallows in his yard and chewed on his pipes for water. When he chases them, they run back to Matsumoto's land. Matsumoto, a retired contractor and at 80 as lean as a teenager, believes the pigs deserve a fair shake. Claes, half his age with a military haircut and barrel chest, sees the pigs as destroyers of the forest. "This is an issue about the aina," he says. But Claes has allies on the County Council, which approved a program, starting Wednesday, under which federal agents will trap wild pigs on private property when the owner requests it. 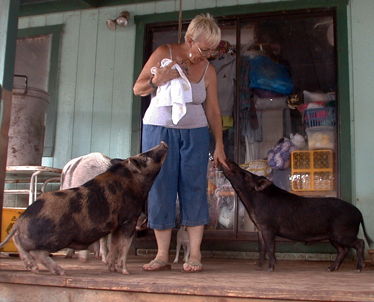 HILO » There is no neighborly aloha in the Fern Forest subdivision south of Hilo -- when it comes to pigs. Sueo "Su" Matsumoto and his wife, Sharene, living in the densely wooded subdivision, love pigs. They feed about 100 feral pigs, many of which come out from the trees for free meals when Matsumoto bangs on a can. A few hundred feet up the gravel road in this woodland community, "Paradise Paul" Claes hates pigs. Killing them when he can, in 17 months he has fed the meat from 85 pigs to all takers at the Fern Forest community center, he says. Matsumoto has seen pet pig Benedict shot illegally with crossbow arrows that pierce but do not kill, seen pet Dante hacked across the head with a machete, blinding one eye, seen pet Bobo lose both ears in a fight with dogs. Claes said some of his dogs were killed by pigs. Bobo lost his ears attacking Claes' dogs, he says. Pigs tore up Claes' garden, made wallows in his yard, chewed on his pipes for water, he said. When he chases them, they run back to Matsumoto's land. Claes is unapologetic about eating their meat. "We ate Goldilocks. We ate Snow White," he said. Matsumoto admitted he carries a gun at times. He said Claes does, too. Ex-Marine Claes denied owning a gun. He wears a knife with a 12-inch blade and showed a heavy iron bar he uses to crush pigs' skulls. It is more humane than a machete because death is instantaneous, he said. Sharene Matsumoto holds a baby pig while spending a moment with a few of the 100 pigs she and husband Sueo have befriended. To the right is Ebenezer, to the left, Cletis, and behind Cletis, the rump of 400-pound Herve. These antagonists look like figures from an action movie. Retired California contractor Matsumoto, with a fountain of white hair topping his head, is 80 but as lean as a teenager. Claes, half his age, wears a military haircut and puffs out a barrel chest like a weightlifter. Matsumoto says the pigs were in this forest before people carved it up for homes. He started feeding wild pigs after three boars, two sows and 12 babies appeared one day. A few days later he heard shots. The babies came back without the adults, so the Matsumotos fed them. The Matsumotos now pay $600 a month for bags of commercial Pig Grow. Since humans are the most advanced creatures on earth, they have a duty to care for animals, Matsumoto said. Claes said roaming pigs destroy people's yards and the forest. "This is an issue about the aina," he said. For 17 months he has tried unsuccessfully to get government agencies to do something. Janice Okubo at the state Department of Health said an inspector went to Matsumoto's home April 24 and found no health hazards. Debbie Ward at the Department of Land and Natural Resources said, "We don't recommend that the public feed wild animals." But the department has no authority on private land. Pigs have torn up the gardens of county Councilman Bob Jacobson, who represents Fern Forest. "I harbor ill feelings towards pigs and would like to eat every single one of them," he said. He and the entire Council voted to spend $250,000 on an islandwide program proposed by Councilman Dominic Yagong. The program, which starts Wednesday, will pay U.S. Department of Agriculture agents to trap wild pigs on residential property where the owner requests it. The agents, who are appropriately licensed, will shoot the pigs on the spot. The homeowner can keep the meat, donate it or let the carcass be buried in a landfill. "This is not an eradication program," Yagong said. "It's a control program in residential areas." The program has received 200 calls so far, he said. The number is 933-6956.